State-of-the-art, unmanned aerial, surface and underwater drones were on full display at the University of Hawaiʻi at Mānoa Hawaiʻi Institute of Marine Biology on Coconut Island. This was part of the third Maritime Awareness Network of Teaming Autonomous Systems (MANTAS) event in October 2018 by the UH Applied Research Laboratory, or ARL. In one demonstration, an ARL drone pilot flew a $250,000 LiDAR payload developed by Denver-based tech company ASTRALite, around Coconut Island. Their hybrid technology measures both topography and bathymetry, the underwater equivalent of topography. During the flights, ASTRALite used their sensor to inspect coral reefs and underwater infrastructure such as bridge pilings that surround the island. Read more here at UH News. Ensenada's city’s police department claims a solitary DJI Inspire 1 Quadcopter led to more than 500 arrests and a 10 percent drop in overall crime rates, with a 30 percent drop in home robberies after a few months on patrol. According to a recent survey released by Munich Reinsurance America Inc., the popularity of drones is flourishing on the farm, with three in four U.S. farmers (74%) currently using or considering adopting the technology to assess, monitor and manage their farm. The online survey, which polled 269 U.S. farmers, was conducted by Qualtrics in April 2018. According to the survey, 76% of all respondents have concerns related to drone usage: Privacy issues (23%) topped the list, followed by cyber security concerns over data captured and transferred (20%), and potential damage or injury from the drone (17%). The FlightWave Edge unmanned aircraft system (UAS) was recently part of a flotilla of autonomous underwater vehicles, autonomous surface vessels and UAS being used on the research ship R/V Falkor in the Pacific Ocean, 1000nm west of the California Coast. Drones may be a relatively new technology, but artificial intelligence (AI) is already taking the controls. Autonomous drones are beginning to see use in jobs that require smooth, consistent flying, such as deliveries, and NASA and Google have even teamed up to experiment with how autonomous drones compare to human pilots when racing against each other. They discovered that even though humans won the race in the end, they needed to spend more time practicing before they were able to outspeed the autonomous drones. FAA Webinar: "Unmanned Aerial Systems What Every Pilot Needs to Know"
Topic: Expanding our understanding of UAS integration and operations for pilots of both manned and unmanned aircraft. Description: Our airspace is now shared by pilots of both manned and unmanned aircraft. Often, we don’t understand enough about this new mix of aircraft operations. It is imperative that we all share a common understanding of how and why this blend works, and how to maintain and improve the impeccable safety record that general aviation has enjoyed for decades. This webinar is an important resource to get all pilots on the same page and will answer many of the misconceptions that we have about manned and unmanned operations. Good Friday turned Great for over 100 attendees of the UH Drone Boot Camp. UH ARL, in collaboration with the Office of the Vice President of Research and Innovation, hosted a basic introduction into the world of drones, or Unmanned Aerial Systems (UAS) for the general public. Hawaii Governor David Ige opened the event, followed by short welcomes by UH President David Lassner and ARL Director Margo Edwards. Under the FAA’s Part 107 small drone rule, operators must secure approval from the agency to operate in any airspace controlled by an air traffic facility. To facilitate those approvals, the agency deployed the prototype Low Altitude Authorization and Notification Capability (LAANC) at several air traffic facilities last November to evaluate the feasibility of a fully automated solution enabled by data sharing. Based on the prototype’s success, the agency will now conduct a nationwide beta test beginning April 30 that will deploy LAANC incrementally at nearly 300 air traffic facilities covering approximately 500 airports. The final deployment will begin on September 13. Consumer Report: Which Drone is Best? For the larger UAS, categorized as “outdoor only,” CR put the $900 DJI Mavic Pro, and for the smaller UAS, categorized as “selfie drones,” the $400 DJI Spark reigned supreme. 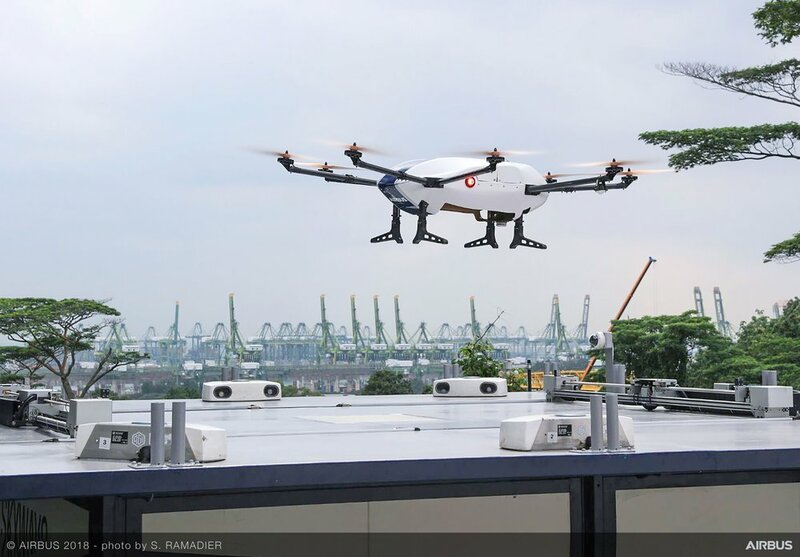 Airbus Helicopters’ Skyways delivery unmanned air vehicle (UAV) has successfully completed its first flight demonstration, which took place at the National University of Singapore (NUS). The drone took off from its dedicated maintenance center and landed on the roof of a specially designed parcel station, where a parcel was automatically loaded via a robotic arm. Once loaded with the parcel, the Skyways drone took off again and returned to land, demonstrating its automatic unloading capability. THE AERONAUTICAL SCIENCE PROGRAM at the University of Hawaiʻi at Hilo will host a four-week course on small Unmanned Aerial Systems (sUAS)(ie: drone). This training will consist of three weeks of online lectures (1 hour M-F) to prepare students to take the FAA Remote Pilot Exam (Part 107) and three days of on-site flight training. Topics covered include: sUAS regulations, airspace, aviation weather, UAS performance and operation. Flight maneuvers include: pattern flying, takeoff, landing, emergency maneuvers, and autonomous operation. Local drone experts discuss their work with local farmers and drone technology to assist Hawaii's farms via mapping capabilities, addressing ag theft and more. UH UAS Program Director Ted Ralston invites Jim Williams, ex FAA chief of UAS integration to talk about the eventful year we had in the world of drones, and the FAA UAS Integration Pilot Program. UH UAS Program Director Ted Ralston is joined by Ray Tsuchiyama and Dr. Peter Quigley to discuss how UAS can help grow Hawaii's economy. On December 12th, President Donald Trump signed into law the National Defense Authorization Act (NDAA) for Fiscal Year 2018, which includes a provision to reinstate federal registration for hobbyist unmanned aircraft systems (UAS).